Shopping in Glen Arbor, Michigan, is a charming experience that adds to any Northern Michigan vacation. Located in the center of the Sleeping Bear Dunes National Lakeshore and wedged between Lake Michigan’s Sleeping Bear Bay and the Glen Lakes, this stunning natural backdrop is filled with one-of-a-kind shopping experiences. Put on your comfy flip-flops, grab plenty of shopping bags and come along as we walk you through some of the shops and boutiques along M-22 (called Western Avenue in downtown Glen Arbor) and Lake Street. Let’s start on the south end of South Lake Street at Cherry Republic, the flagship shop of the world’s largest exclusive retailer of cherry creations. Cherries are a signature part of Northern Michigan’s agricultural and tourism economy. Browsing the selection of jams, preserves, candies, wine and logo wear has become a traditional part of a Glen Arbor vacation. Glassware from Ruth Conklin in Glen Arbor. At the corner of South Lake and Western Avenue, you’ll come to Cottonseed Apparel. If you love dresses—and purses, skirts, sweaters, tops—this is your rabbit hole. You’ll find styles for both beach living and work in colors and fabrics galore. Next to the Cottonseed is the Totem Shop—a Glen Arbor icon. The Totem Shop has been selling moccasins, sweatshirts, beach toys and other vacation essentials for as long as anyone can remember. Tired? Cross Western Avenue and head down South Lake to the beach on Sleeping Bear Bay with its view of North and South Manitou Islands on the horizon. Before you get to the beach, stop at Sleeping Bear Market at the top of the street. Order up a Hawaiian Shave Ice and browse the jewelry at the Sleeping Bear Salvage Co., the Yarn Shop and the art of Lily LaFollette—all a part of the Sleeping Bear Market. Up North apparel for the whole family. Nautical apparel and cottage decor. Minimalist apparel inspired by the waves, wind, beaches and woods along M-22. Homemade t-shirt designs handprinted on top-quality casual wear. An upscale seasonal women’s fashion boutique. A wood shop, art studio and seasonal gallery inspired by the natural beauty of Northern Michigan. For 25 years this gallery has been brining the natural beauty of the shores of Lake Michigan to life. An eclectic mix of more than 90 Michigan artists. The year-round shop offers a large selection of titles and story hours during the summer. A full service yarn shop offering knitting notions, patterns, private classes, yarn, custom-made furniture, antiques and collectables. A large selection of yarn and hand-knitted apparel. 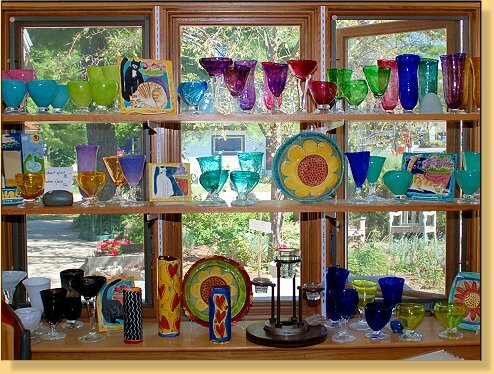 Pottery, lamps, dishes, wall art, pillows, silk flowers, jewelry, baby clothing and toys along with a selection of plants and flowers. A world of tea and spices. A world of coffee varieties roasted right in downtown Glen Arbor. Stop in for a latte and load up on signature local blends. A large selection of items for your home, personal beauty, baby and the beach. A gallery of handmade, repurposed, natural and sustainable products. Kayak, bike and paddleboard rentals along with wine tasting and other summer fun essentials. Outdoor apparel from top outfitters along with everything you need for your next fishing trip. Homemade lavender soaps in a charming setting near the beach.